I bet David, Gideon, Duncan-Smith and the rest of the chaps left Westminster today thinking “That all went rather well, didn’t it?” Nothing was a surprise, they said pretty much what was expected of them and all in all, it was a very unremarkable event. Consider for a moment that this wasn’t just a tweet, but a tweet which included an image specifically created for the budget. So what you have here is NOT a spur of the moment tweet, where somebody had a momentary lapse of judgement and acted rashly, or has spoken out of character. 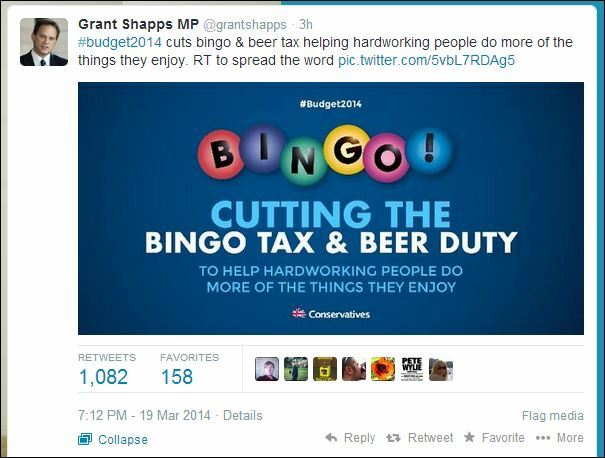 The Tories planned to tweet this after the budget had ended, presumably because they actually believe it. This very simple graphic, perfectly encapsulates the Conservative Party’s view of those they consider to be of a lower social standing. This graphic tells the working class that they are bingo playing, beer swilling plebs, reliant upon their Tory betters for sustenance and entertainment. It beautifully demonstrates how this breathtakingly idiotic party’s collective minds work! Ladies and gentlemen, I give you the government of this United Kingdom…The Conservative Party.